Brookgreen Gardens, located close to Myrtle Beach, as a combination of art, history, and wildlife that touches your heart. 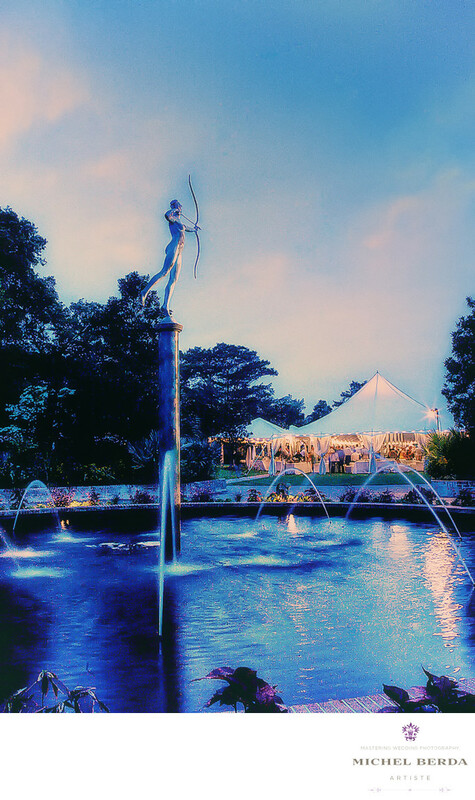 Weddings at this location with its beautiful surroundings that combines art and nature, an event at Brookgreen Gardens, with its majestic live oaks and world-renowned sculpture collection, you will treasured the memories of an unforgettable wedding there. It is such a great honor to be a wedding photographer at this amazing venue. I was so very fortunate to have gotten this great opportunity from my past clients, the ceremony was on the lawn with the golden statue and the reception under the tent, I saw this beautiful statue with his bow pointing at the reception the lights the water, the tent, knowing that I could freeze the water as I dialed down my exposure and lowered my shutter speed, I was able to capture this amazing image from Brookgreen Gardens, with the cloud and skye above. Keywords: Brookgreen Gardens (6), Myrtle Beach (3), Myrtle beach Wedding Photographers (3), Wedding Photographer (1254), Weddings (168).